My Family Fun - Barbie Three Story Dream Townhouse Who wouldn't want to live in the ultra-posh? Who wouldn't want to live in the ultra-posh? 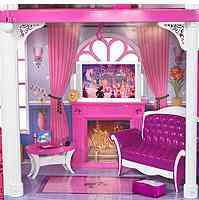 Barbie 3-Story Dream Townhouse include a pink personal elevator, and lights and sounds on every level! 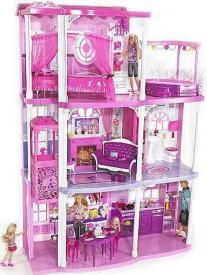 Sounds include doorbell, kitchen timer, crackling fireplace, shower humming, and flushing toilet.